Take on Condover Hall’s purpose-built abseiling wall. As participants improve, more advanced abseiling techniques such as the ‘commando jump’ style will be taught as students are encouraged down the tower. Every participant will be guided through harness and helmet safety checks prior to approaching the tower with all sessions run by fully trained on-site instructors. Fly through the air on the adrenaline-pumping zip wire! Attached by a harness, students will make their way to the top of the purpose-built platform before clipping in and sailing through the trees. A fully trained instructor will provide students with a harness and helmet and run through a safety briefing prior to the activity. A favourite with students, the purpose-built climbing tower is one challenge you won’t want to skip. Following a safety briefing, students will be guided through effective climbing techniques by the team of on-site trained instructors as they aim to reach the tower’s summit. Featuring multiple activities, the high ropes course presents students with a range of adventure activities in one session. 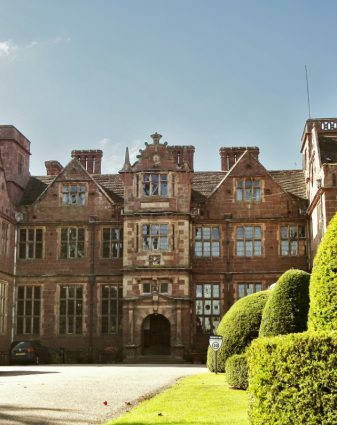 Developing team-building and communication skills, students can enjoy crate stack, gladiator challenge, high all aboard, Jacob’s ladder, and trapeze to name but a few available at Condover Hall. The Grid of Stones provides students with a unique indoor activity. Players must apply memory and concentration skills to navigate across the room through effective communication with their team. Find the correct route and get the green or return to the start and try another root in a bid to avoid the red floor lights. The new on-site lake at Condover Hall presents students with the perfect environment to build confidence and learn canoeing. Participants will learn the correct use of the paddle and how to maintain control of their canoe through a series of manoeuvres. Full safety equipment is provided and a safety briefing will take place prior to taking to the water. New to Condover Hall, the high aerial trek stands in addition to the high ropes course. Offering a 9 element course, including Indy Bridge, parallel wires, and criss-cross rope challenge, both thrill-seekers and those seeking a greater challenge will love the grand finale – the fan descender. St Chad’s Church St Chad’s is the Parish Church for the centre of Shrewsbury. The church arranges concerts all year round and has a popular lunchtime concert series on Fridays at 12:40. The unusual round shape of the church makes the building unique whilst promoting a sense of inclusion and unity. Chester There are a number of venues which are happy to welcome performances from youth ensembles of all types. Venues range from the main Town Square, the bandstand along the river, local churches and nursing homes. Shrewsbury Bandstand The largest park in Shrewsbury is busy with events all year round. At its centre lies “The Dingle”, a beautiful sunken garden with water features created by garden designer Percy Thrower of Blue Peter fame. Groups are invited to perform in the summer months to entertain the many visitors. Oswestry Bandstand The traditional covered bandstand in Caes Glas Park hosts concerts throughout the summer months. St Oswald’s Paris Church St Oswald’s is a busy church with a history spanning 1,000 years. Music is a very important part of the church’s life and St Oswald’s boasts an active choir and a fully restored organ. Visiting choirs are welcome to perform in the church, especially during the resident choir’s holidays. Experience traditional Irish hospitality and love of music in the Irish capital with an organised music trip.